Whole grains: Cooked whole grains such as sorghum, brown, black, red, or wild rice, quinoa, farro, barley, kasha, wheat berries, rye berries, Kamut, millet, amaranth, or freekeh go in the bowl first. 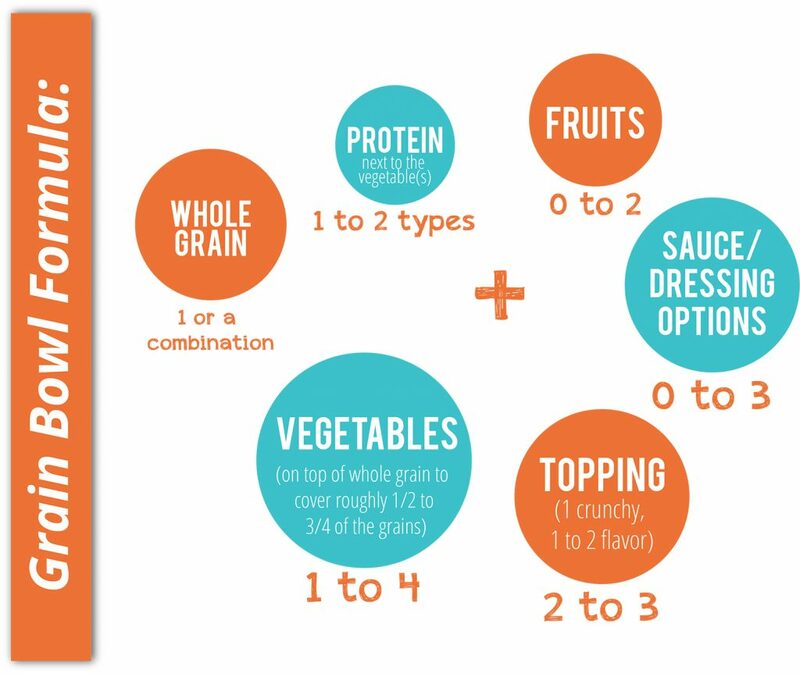 Feel free to mix two or three different whole grains together. Vegetable: Any raw, steamed, roasted, marinated, sautéed, or pickled vegetable works. For heartier greens such as kale, collards, or cabbage, rub with a little vinegar to tenderize. Roasted vegetables, like Japanese eggplant, beets and broccoli, are magnificent in these bowls! Lentils, chickpeas, beans, dried peas of any sort, pickled vegetables (such as kimchi or pickled cauliflower), marinated vegetables such as artichoke hearts also add flavor to the bowl. Protein: Choose a creamy cheese such as ricotta or fresh mozzarella, poultry, pork, beef, lamb, fish (leftover or freshly cooked), eggs (over-easy, fried, soft boiled, poached, or scrambled), chickpeas, beans, lentils, dried peas, edamame, tofu, tempeh, or seitan. Smoked meats and strongly seasoned meats go a long way to add flavor to the whole bowl. I often use roasted or canned salmon for protein. Fruit: Avocado offers delicious creaminess, but other fruits add a bit of sweetness to balance the flavors. Pineapple, mango, pomegranate, papaya, chopped apples, pitted and sliced Medjool dates, dried cranberries or cherries are a few ideas. Just don’t limit yourself! Topping: To add some crunch to your bowl, toss in a few toasted nuts or seeds. Try to avoid croutons. I usually buy my nuts already toasted from Trader Joe’s, but it’s easy to toast nuts in a skillet. Sunflower seeds, hemp seeds, sesame seeds, or pomegranate seeds are a satisfying addition. For flavor variety, try adding reserved lemon, pickled vegetables, toasted seaweed, nutritional yeast, fresh herbs, cheese (such as feta, goat, or Halloumi), chutney, or Kalamata olives. Sauce/dressing: Olive oil or infused olive oil, regular or infused balsamic vinegar, other types of vinegar, pesto, vinaigrette, tahini sauce, sesame oil, peanut sauce, hoisin sauce, teriyaki sauce, fish sauce, tamari, soy sauce, tamarin liquid amino, salsa, chutney, anchovy paste, chili-garlic sauce, gochujang (Korean chili sauce), harissa, Sriracha, miso, hummus, baba ghanoush, plain yogurt, fresh lime, or lemon can be used to add gusto and moistness to your bowl. 1) Use my Grain Bowl Formula above as a guide: For this grain bowl I added cooked red rice to the bowl for my whole grain. 2) Preheat oven to 425 degrees. Roast cauliflower and sweet potatoes by placing a sheet pan (use a silicon baking mat or foil if desired) in your oven. Cut the vegetables and toss with a little high-heat oil like regular (not extra virgin) olive oil, avocado oil or refined safflower oil. Add salt and pepper and spread out on the hot pan to cook until tender and a bit browned (sometimes I put it under the broiler to finish it). 3) Meanwhile, add diced fresh red bell peppers to the bowl on top of the rice. When cauliflower and sweet potatoes are tender and browned add them over the rice so all the vegetables cover roughly 1/3 to 2/3 of the red rice. 4) Place cooked chickpeas and sliced avocados next to the vegetables in the bowl. 5) Top with sunflower seeds and Guilt-Free Creamy Salad Dressing for a delicious grain bowl!